Baden 1850, Vorphilabrief von Salem nach Meersburg. Entwertet mit sauberem Rahmenstempel in rot SALEM: 31 Mai. 50.. Rückseitig Ankunftsstempel in blau MEERSBURG 30 MAI. Taxvermerk in rot. Sehr gute Gesamterhaltung. Brief mit Inhalt. 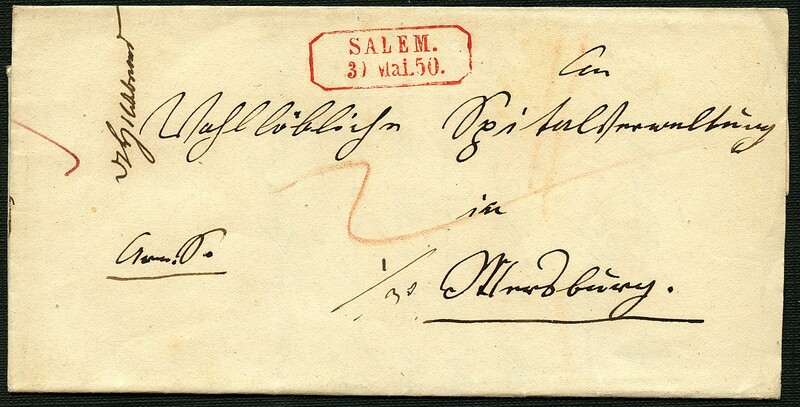 Baden 1850, pre philately letter from salem to Meersburg. Tied by clean rectangle cancel in red salem: 31 May. 50. . Reverse arrival postmark in blue MEERSBURG 30 May. Rate marking in red. Very good quality. Cover with content.